Enjoy discounted golf rates at Kilmarlic Golf Club, instructional access, club dining, and special weekly summer sports camps for the kids when your Outer Banks vacation rental is a member of the K-Club. K-Club Kids Camp: Open to children between the ages of 7 to 14. This camp is great when the children are tired of the beach or you want a break to do some parental exploring of the Outer Banks. The Camp will offer professional golf and tennis instruction plus optional swimming and basketball. Lunch will be provided. Thursdays 8:30 am to 2:30 pm - $60.00 per child. 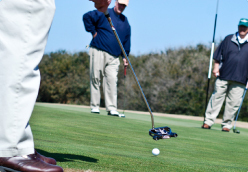 K-Club Friends and Family Golf Clinic: This is a fun-filled golf clinic for the family or a group of friends. Loaner clubs are available as needed. Tuesdays 1:30 pm to 3:00 pm - $15.00 per person.